This was my first bee keeping book. Beekeeping For Dummies is a grate place to start if you are considering bee keeping. I would defiantly recommend it to any one thinking about bee keeping. 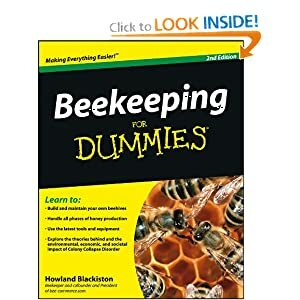 It gives you all the basic knowledge you need to become a bee keeper. The book gives tells you how to set up your hive how to order bees and install them. What tools you may or my not needs to get to start. It goes into what problems insect and disease problems you will need to keep an eye out for.